Thoroughly mix dipping sauce ingredients; set aside. In a deep frying pan, saute bok choy and mushrooms in peanut and sesame oils over medium-high heat until crisp-tender. Remove and keep warm. 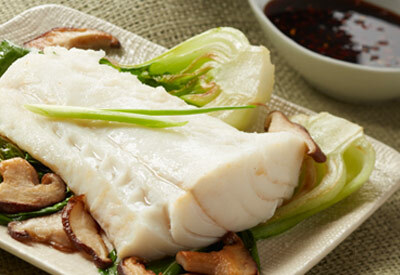 Serve Alaska Cod over sauteed vegetables with dipping sauce; garnish with remaining green onion slices. Substitute Alaska Pollock or Sole fillets for Alaska Cod, adjusting cook time for smaller fillets if necessary.